When you score Reeducation, add any number of cards from HQ to the bottom of R&D and draw that many cards. The Runner randomly adds the same number of cards from his or her grip to the bottom of the stack, if able. 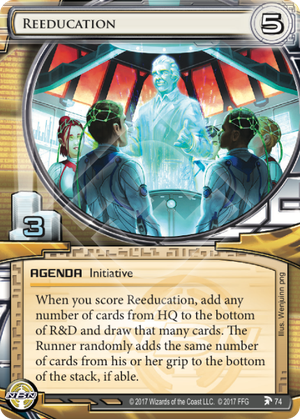 If the Corp uses Reeducation to add more cards from HQ to the bottom of R&D than the Runner has in their grip, does the Runner still have to randomly add cards to the bottom of their stack? No. If the Runner does not have enough cards with which to resolve the effect, then they are not "able" to do so. A quirky agenda. On one hand shoving the runner's entire hand into the dungeon seems really good, and it also has the nice benefit of fixing any residual flood you had while drawing new cards. On the other hand, NBN and 5/3s have always been flaky. THeir ICE is generally porous and outside of a Data Raven Data Ward server It seems pretty difficult to keep this alive for more than 1 turn. However, this card really shines with 24/7 News Cycle (like every other NBN agenda) This agenda can create kills and completely negates Meat Damage protection. Start turn, have 6 cards in hand. Draw 1, then play 24/7 to shuffle 6 away, minus 1 Neural EMP. 24/7 News Cycle+ Reeducation + Neural EMP. Bam, dead. And who packs net damage protection against NBN, anyway?